Some of the earliest scientific investigations of glaciers occurred here on the Unteraar Glacier, near the Grimsel Pass in Switzerland. The natural philospher Horace-Benedict de Saussure from Geneva visited in 1783 and described his visit in his Voyages dans les Alpes. Here Franz Hugi in the 1820s and Louis Agassiz and his team from Neuchâtel in the late 1830s made the first measurements of the velocity of glacier movement. 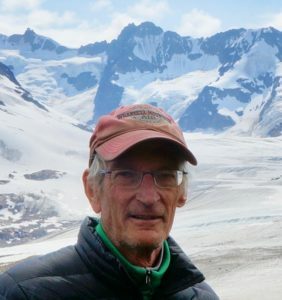 That Hugi’s measurements of the giant boulder he tracked actually reflected the movement of the glacier was initially dismissed by skeptical contemporary critics with the now ludicrous argument that the boulder was sliding down the glacier. Mark Twain described the results of these measurements, as well as a visit to this glacier, in A Tramp Abroad in 1880. Hugi’s boulder finally reached the terminus of the glacier in 1967 after traveling about three miles since Hugi began his studies. 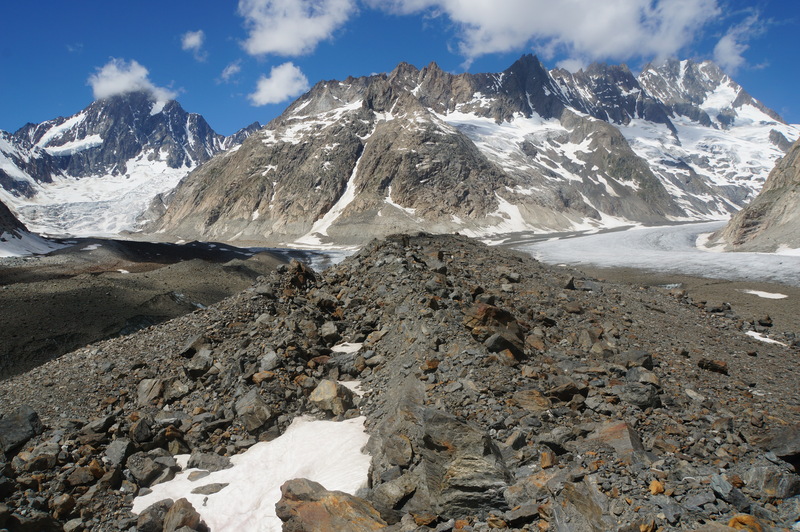 Owing to the retreat of the glacier, the boulder now lies about 550 yards beyond the front of the ice in the modern outwash plain of the glacier. Hugi’s boulder is a modern example of how giant glacial erratic boulders like the Pierrabot reached their current resting places. Rubbly medial moraine running down the center of the Unteraar Glacier as it appeared in 1840 with boulder tracked by Franz Hugi. The location of the stone hut called the Hotel de les Neuchâtelois where Agassiz’s team stayed is on this moraine in the distance. 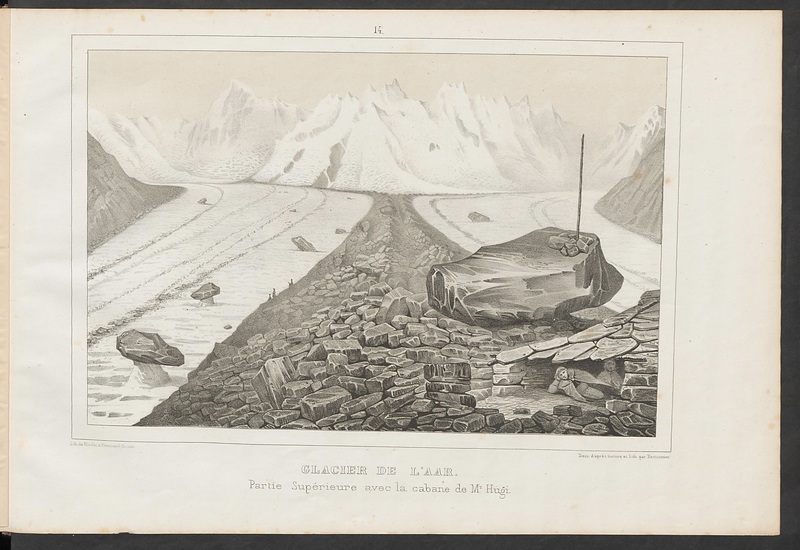 (Engraving from Agassiz, Etudes sur les glaciers, 1840). The medial moraine of the Unteraar Glacier near the location of where Hugi’s boulder stood in 1840 as it appeared in 2018. The peak in the left distance with its summit in the clouds in the Finsteraarhorn, higest peak in the Bernese Alps. The high peak in the right distance is the Lauteraarhorn.